Nanalulu's Musings: Cute Halloween Ideas! Create these easy vintage-look Halloween ornaments from a purchased graphics, glitter, tinsel, and jingle bells. 1.Cut a circle from a Halloween graphic, such as a photo or postcard, the size of the acrylic circle. 2.Lightly spray the front side of the graphic circle with adhesive. Press the adhesive side of the circle onto one side of the acrylic circle. Spray the back of the graphic circle with adhesive and center on the star; press in place. 3.Apply crafts glue over the front of the star up to the edges of the acrylic circle using a paintbrush. Sprinkle glitter on the wet glue. Let glue dry. Tap off the excess glitter. Apply glitter on the back of the star if desired. 4.Apply glue along the edge of the acrylic circle. Press tinsel into the glue; let dry. Punch a hole in the top point of the star. Insert the ribbon through the hole, bring the ribbon ends together, and knot about 1 inch from the ends. Glue a jingle bell at each point of the star; let dry. 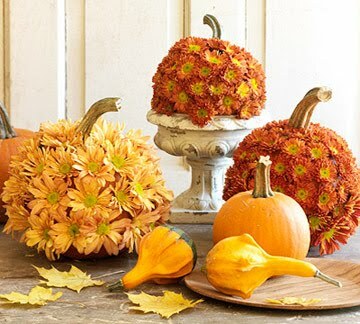 Make these pretty pumpkins by using hot glue to attach mums to real pumpkins. Pretty!